On Wednesday, May 30th, NASA held the “Transformative Lunar Science” talks in the James Webb auditorium at NASA Headquarters. 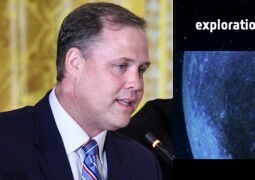 Hosted by Dr. James Green, NASA Chief Scientist, the talks, which were open to the public, discussed cutting-edge science that is transforming our understanding of the Moon, and what we can still learn from our nearest neighbor. The talks included a panel discussion with Mr. David Schurr, Deputy Director of NASA’s Planetary Science Division, and Dr. Jason Crusan, Director of the Advanced Exploration Systems Division. Three preeminent lunar scientists presented short talks on some of the biggest questions that the Moon can answer, followed by a Q&A and panel discussion on the future of lunar science and exploration. Dr. Carlé M. Pieters, (Brown University) spoke about the lunar water cycle; Dr. Robin Canup, (Southwest Research Institute) talked about the origin of the Earth-Moon system; Dr. David Kring, (USRA Lunar and Planetary Institute) spoke about how the Moon can reveal the chronology of the Solar System. The Q&A was moderated by Dr. James W. Head III (Brown University).